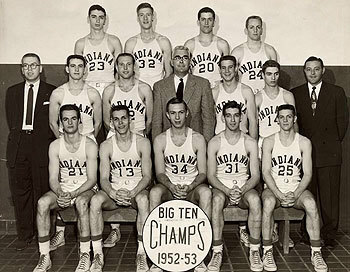 The 1953 NCAA Men's Division I Basketball Tournament involved 22 schools playing in single-elimination play to determine the national champion of men's NCAA Division I college basketball. It began on March 10, 1953, and ended with the championship game on March 18 in Kansas City, Missouri. A total of 26 games were played, including a third place game in each region and a national third place game. At this time, the NCAA tournament was still considered a second rate tournament compared to the NIT. Indiana, coached by Branch McCracken, won the tournament title with a 69-68 victory in the final game over Kansas, coached by Phog Allen. B.H. Born of Kansas was named the tournament's Most Outstanding Player. Meanwhile, Indiana (19–3) rose to No.1 in the final AP Top 20 and wound up meeting third-ranked Kansas (back despite the graduation of Clyde Lovellette and three other starters) in the NCAA final at Kansas City. The Hoosiers won, but needed a Bob Leonard free throw with 27 seconds left. Indiana's 6-10 center Don Schlundt had 30 points in the final, but Kansas' 6-9 center B.H. Born was named the outstanding player of the tournament with 28 points against Washington in the semifinals and 26 more against Indiana.